We saw Jay’s work on the internet and knew we had to show it off. Just look at the time and energy Jay put into making this a great display! DV: How long have you been collecting? DV: What’s your favorite Disney Vinylmation in your collection? Jay: That’s a tough question, if I had to pick just one it would probably have to be my Food & Wine Festival Figure “Tony.” My best friend and I went together for the F&W Festival and he picked it up for me as a surprise to commemorate our trip. It is such a great design and holds a lot of memories of the amazing time we had while there. Jay: When I first started collection my favorite artist was Randy Noble, but I haven’t seen any figures designed by him lately. Not sure what happened. Right now, it would definitely have to be Gerald Mendez and Ron Cohee. Gerald puts some great detailing and shadows into all of his figures, and Ron’s use of the ears and the mold as a whole is just remarkable. Both are truly talented artists. DV: Nick loves Ron a lot these days. Speaking of artists, do you own any customs? Jay: None at this time. I might buy one in the near future but right now I just like to look at them especially during the trade events. There are some truly talented designers out there and I often find myself asking how are you not on Disney’s design team? DV: I agree, there’s great talent out there. What’s your favorite custom? Jay: I don’t have a specific figure, but I will say that Mark Hoffman has done some incredible pieces! And he has a very unique style. You can just look at one of his figures and know that it’s a design by Mark Hoffman. I think that is an indicator of a great artist, someone who can take something familiar, like a Disney character, and make it their own while still staying true to the essence of what inspired their design. 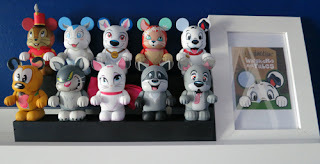 DV: What is one Vinylmation that you don’t own that you want to own? 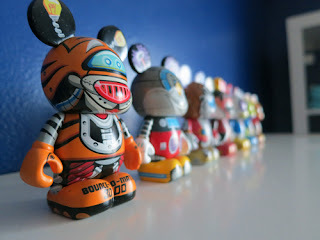 Jay: Right now I am really looking for the Killer Whale Disney Cruise Line vinylmation figure. It is a Little Mermaid inspired vinyl and that is my favorite film of all time. Plus it’s a great design with Ariel’s silhouette in the ear, what’s not to like? DV: I’m sure Zoe is looking for that one too. Back to your work, what inspired your display? Jay: My display sits over my desk and I wanted something clean looking that didn’t look too cluttered (or like I belong on an episode of Hoarders). It took me a long time to settle on this specific set up. 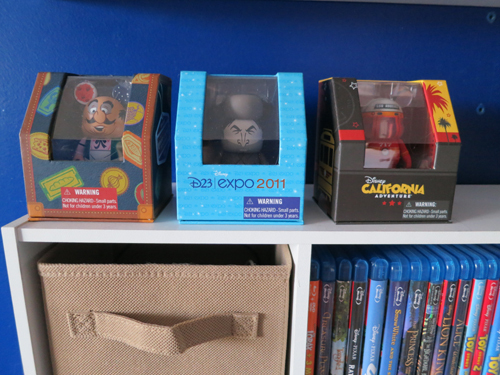 I hated trashing the boxes because some of the art work on the boxes is awesome (some leave something to be desired *looking at Animation and Pixar*) and I wanted to keep figures within a set together so I took those two requirements and that is how my display was born. DV: That’s brilliant, what did you do to make it? 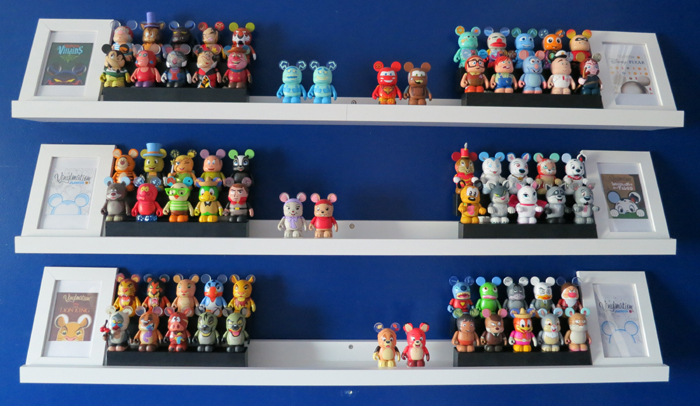 Jay: The shelves and the frames are all from IKEA and the black stands are from The Container Store. I took the 3-tiered figurine shelves they sell there and tossed out the bases and just used the steps. I used Legos to prop up the back rows to the height I wanted. The shelves are designed to hold up photo frames so they have a lip on the front of them. I used Legos on the front figures to raise them up so they are sitting flush with that lip. It’s a very complex process (not really) but it did take me a while to figure things out. DV: I enjoy the use of lego! A perfect combo. Any other thing you’d like to say? Jay: Well again thank you for allowing me to share my collection and I just want to remind everyone to Make Fun, Not War. That is what hobbies are all about right? Having fun! So let’s have fun with it! DV: Exactly, and everyone, Keep On Collecting! Very classy display. Love it.